I hope everybody has been enjoying this colorful Autumn! I love shopping (no surprise there / sorry Mom), especially when there are so many new styles out for new seasons. However, I am on a saving money kick as of lately, so I’ve been limiting myself to (online) window-shopping. Score one for self control! Anyway, I’ve decided to share with you some of my favorite things I’ve been finding (and trying so hard not to buy!) from some of my favorite stores. Maybe you’ll find some gems and buy them and I can live vicariously through you (please)! These two sweaters are both from H&M & I love them. They both have short sleeves, which is fun & the details on both of them are playful and add a little bit of interest. They would be perfect with darker colored jeans (think black, maroon, dark green). The details on these also mean you don’t even have to find a necklace to wear, so getting dressed in the morning is that much faster! Get these sweaters here & here. Clearly, fall is all about sweaters & this fuzzy pink sweater is great. I actually am loving the whole ensemble here, minus the shoes. 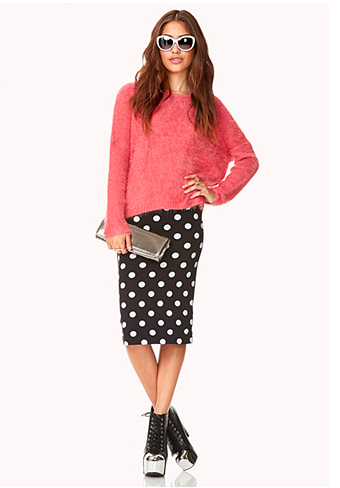 The punchy pink is so fun with the polka dot midi. It actually makes me feel like this color/pattern combo should never be without each other. This outfit could be casual enough for class, work, meeting up with friends, or it could be easily dressed up for fancier occasions. Okay, I am obsessed with this kimono. 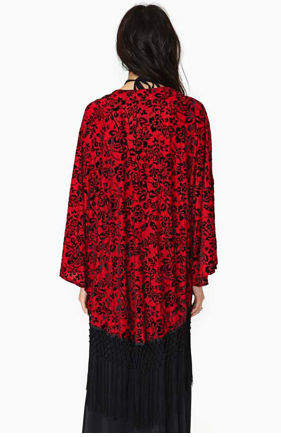 The red velvet and floral print is so dramatic and romantic – perfect for fall & can carry into winter. It’s a little bit victorian, a little bit bohemian. This is definitely a great statement piece. I cannot get enough of this one. Talk about statement pieces! This little jacket comes with its own attitude people. The neon green is so unexpected & looks amazing with the edgier pieces. I would totally rock this over black jeans or a dress with a chunkier metal necklace and boots. This almost reminds me of the iconic Chanel suit, but less expensive and way cooler. I’m currently having an art-deco, 1920s obsession, which is one of the reasons I love this blouse. 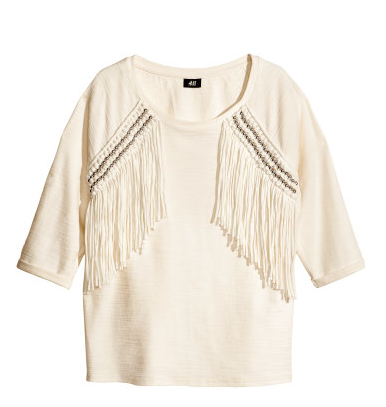 It’s simple, but the embellishment is so pretty. Not only is this slightly art-deco, but the beading also reminds me a little bit of spider webs, which is fitting for this time of year (hello, Halloween!). Continuing with my 1920s obsession – this party dress is amazing! It isn’t too theme-y, but it’s like an ode to the era with the art-deco patterns and sparkle. Because the shape is modern, it wouldn’t even be overkill to dress this up with 1920s inspired bling, maybe even a killer headpiece (that hat is killing me, but not in a good way). I’m obviously very into reds and velvet this season, so these two dresses definitely caught my eye. 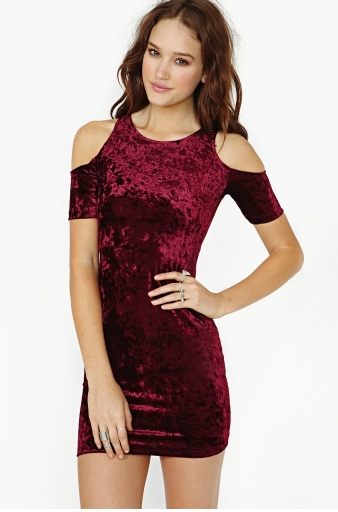 The dark velvet dress is so rich and the shoulder cutouts add that extra detail that makes it stand out. This bright red dress is like the perfect party dress in my book – its got the texture, the print & the fun, full skirt. This dress happens to be from Forever21, which means its on the cheap-side. I’m all for that, clearly, but with a dress like this, I would be a little careful – I bought a similar dress with cute tulle from there a long time ago, and it looked very cheap. That being said, its not a guarantee that all dresses like this will be the same way. I love jeans, and I like finding ones that go beyond the average black and blue. This khaki green pair is great for fall & the detail on the bottom is unique. These actually came in black too, and I couldn’t decide which I liked better, but I have enough black already. These faux tweed & leather pants are AMAZING. I have no other words to describe them… and they are on sale! If you’re really feeling like livin’ on the wild side, these pants would look insane with the neon green jacket from above. Anyway, I hope you enjoyed seeing some of my favorite fall picks & got some seasonal inspiration!